A youth thought to have been targeted by the gang who shot a five-year-old girl and a man in south London has contacted police. Thusha Kamaleswaran and the man, 35, were hit in the chest and face respectively at the Stockwell Food and Wine shop, Stockwell Road, on Tuesday. A £50,000 reward has been offered for information. It happened as three youths on bikes chased two others. Now Det Ch Insp Tony Boughton said one of those targeted had contacted them. The 35-year-old man, named locally as Roshan Selvakumar, and Thursha are in a critical but stable condition. 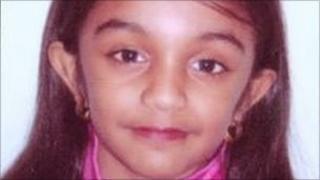 Thusha is currently under sedation and her parents are keeping a bedside vigil, a family friend said. Velluppillai Navaratnam, 49, from Croydon, south London, said: "It has been a very difficult time for family and friends. "The parents of Thusha are at the hospital now. We are all praying for her to get well soon." Crimestoppers and the Association of Convenience Stores have now offered the reward about the "heinous" crime. Dave Cording, director of operations at Crimestoppers, said: "For an innocent five-year-old child to receive such horrific injuries is utterly despicable. "A reward of up to £50,000 is being offered to anyone who can supply us with information leading to the arrest and conviction of the persons responsible. "This is a heinous crime. I hope the offenders will be swiftly brought to justice." Police revealed on Thursday that Thusha's brother, 12, and sister, three, were also in the shop at the time of the shooting, but they were unhurt. The victims were hit when one of three youths on bikes opened fire on two other youths who were hiding in the shop after being chased. The two teenagers had been chased from Broomgrove Road, across Stockwell Road, and into the shop. After the shots were fired, the three attackers were chased by their intended targets from the shop along Broomgrove Road and into the Stockwell Park Estate. James Lowman, of the Association of Convenience Stores, said: "Our thoughts are with the victims and their families after this horrific incident. "We want to help the police, through Crimestoppers, to catch those responsible and we hope that by funding this reward we will play a part in securing more information to support the police investigation." The reward was offered under a new scheme to discourage people from committing violence in small shops. Det Ch Insp Tony Boughton said: "I appeal to those who have information or were involved in this shooting to come forward and assist us with this investigation. "This is a terrible incident where an innocent child has been seriously injured. "We want to hear from the local community, who might have seen these youths cycling around the estate between 9pm and 10pm. "These criminals have seriously injured two innocent bystanders and must face the consequences of their actions." The two youths who hid in the shop and the three who chased them and fired shots were all described as black.